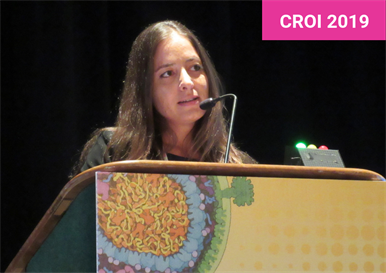 Katrin Sadigh presenting at CROI 2019. Photo by Liz Highleyman. HIV-positive women with breast cancer appear to have decreased survival compared with HIV-negative women, according to a cohort study from Botswana presented yesterday at the Conference on Retroviruses and Opportunistic Infections (CROI 2019) in Seattle. Having HIV was associated with a nearly twofold reduction in survival, and this finding held for women on antiretroviral therapy (ART) with suppressed virus and higher CD4 T cell counts, reported Dr Katrin Sadigh of Brigham and Women’s Hospital in Boston. As people with HIV live longer thanks to effective antiretroviral treatment, AIDS-related mortality has declined dramatically while non-communicable diseases such as cancer and cardiovascular disease account for a growing proportion of deaths. Breast cancer is the leading cause of cancer-related death for women with HIV who have access to effective ART, as it is also for HIV-negative women. Sadigh's team performed a prospective analysis to evaluate the impact of HIV on overall survival of women with breast cancer in a resource-constrained setting. While prior research in the US and Africa has found that women with HIV do not have higher breast cancer incidence, or likelihood of developing cancer, some studies with a small number of HIV-positive participants suggested that survival may be reduced. The current analysis drew from the Thabatse Cancer Cohort, which enrolled nearly 4000 people with cancer at four major oncology centres in Botswana. Participants are evaluated at study entry and followed for five years. Causes of death are obtained from providers, family members and death certificates. The breast cancer cohort included 510 women who sought cancer care at public or private facilities between October 2010 and September 2018. Of these, 151 were HIV positive and 327 were HIV negative. The HIV-positive group was younger on average than the HIV-negative women (media 47 vs 56 years, respectively). In both groups, about 5% were diagnosed with stage I early breast cancer, about 25% with stage II, about 40% with stage III and about 15% with stage IV or metastatic cancer. Both groups also had similar proportions of women with oestrogen receptor-positive tumours (about 35%) and triple-negative breast cancer that doesn't respond to commonly used medications (about 15%); however, more than 40% were not tested for this. Both HIV and cancer care are provided for free by the government in Botswana, Dr Sadigh said. Before 2016, people with HIV started ART when their CD4 count fell below 350 cells/mm3, but thereafter everyone was treated regardless of CD4 count. Most women (85%) were taking ART at the time of cancer diagnosis, three-quarters had done so for at least two years and 70% had HIV viral load below 1000 copies/ml. The most common regimens were zidovudine/lamivudine/efavirenz and tenofovir DF/emtricitabine/efavirenz, at just over 30% each. Breast cancer treatment in Botswana typically involves surgery followed by preventive (adjuvant) chemotherapy for early-stage cancer, or pre-surgery (neoadjuvant) chemotherapy followed by surgery or radiation therapy for those with more advanced disease. Both tamoxifen, a type of hormone therapy for oestrogen receptor-positive breast cancer, and trastuzumab (Herceptin), a targeted therapy for HER2-positive tumours, are generally available, according to Dr Sadigh. Types of treatment did not differ significantly by HIV status, with about 70% of women undergoing mastectomy, about 10% having lumpectomies, about 60% receiving some type of chemotherapy and just under half receiving radiation therapy. Most received multi-modality treatment. During the course of the study, 70 HIV-positive women (46%) and 101 HIV-negative women (31%) died. In both groups, cancer was by far the most frequent cause of death, accounting for around 90% of cases; around 3% of deaths were attributed to adverse effects of treatment. None of the women with HIV died of directly AIDS-related causes. In a multivariate analysis controlling for other factors, HIV-positive women had an 82% reduction in survival compared with HIV-negative women. Having HIV was associated with higher mortality in most subgroups. There was little difference among women with stage IV cancer, who had a high death rate regardless of HIV status. HIV appeared to have a greater effect on mortality in women with early-stage breast cancer, hormone receptor-negative tumours and – unexpectedly – higher CD4 counts (above 350 cells/mm3), a finding Dr Sadigh was unable to explain. "HIV infection was associated with nearly two-fold reduction in breast cancer survival despite good access to ART," the researchers concluded. "Differences in cancer stage, cancer subtype or access to cancer treatment does not explain the disparity." Dr Sadigh emphasised that survival was poor for both HIV-positive and HIV-negative women in this study, and better strategies are needed to speed up diagnosis and improve care. Sadigh KS et al. HIV is associated with decreased breast cancer survival in a prospective cohort study. Conference on Retroviruses and Opportunistic Infections, Seattle, abstract 16, 2019.